The reason I am posting the map is that it was mentioned in an 1876 letter written by Watanabe Kouki (渡辺洪基), who was Director of the Bureau of Documents in Japan's Ministry of Foreign Affairs at the time. Mr. Watanabe was researching the location of Dagelet Island, which was the Western name for Korea's Ulleungdo Island, and he mentioned this map as an example of Western maps that showed Dagelet Island at the coordinates 37 degrees 25 minutes N. latitude and 130 degrees 56 minutes E. longitude. The map shows the island of Ulleungdo labeled as "Matsusima / I. Dagelet" and Liancourt Rocks labeled as "Hornet I.s." It also shows Argonaut Island, which was a non-existent island that came about after the mismapping of Ulleungdo by the British Navy in 1789. It is labeled as "Argonaut I. 1789" on the map. Also, Ulleungdo's neighboring island of Jukdo (2 km offshore) is labeled "Boussole Rk," and a rocky islet at the southern tip of Ulleungdo is labeled "Seal I." 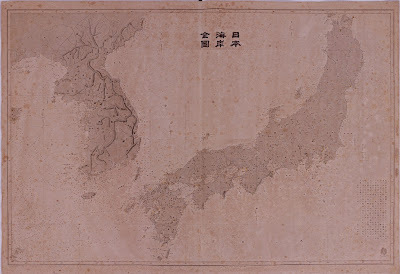 Traditionally, the name "Matsushima" or "Oki's Matsushima" was used by the Japanese to refer to Liancourt Rocks, which Mr. Watanabe believed were Japanese territory, but he suspected that the name "Matsushima" was also being used to refer to Ulleungdo, as Mr. Wyld's 1873 map seems to show. 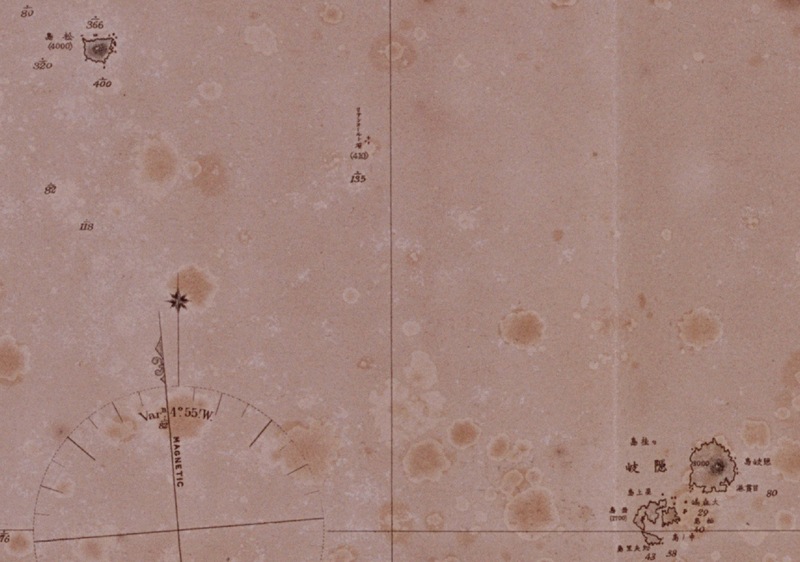 In 1880, the Japanese government finally sent a survey ship to Ulleungdo, where it confirmed that the Matsushima on Western maps was, in fact, Ulleungdo. 1872? 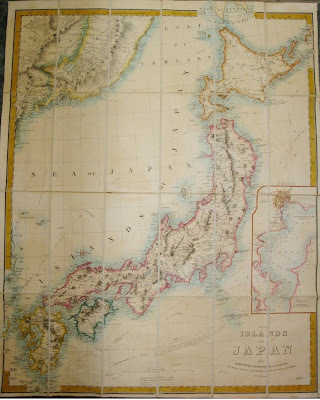 Royal Illustrated Atlas - "Islands of Japan"
Japan, Mandshuria (showing the course of the Amur River), The Kurile Isles, & c.; according to the British and Russian Admiralty Surveys, Krusenstern, Siebald, & c. By John Bartholomew. Section Map.--Port of Nagasaki in the island of Kiou-Siou. 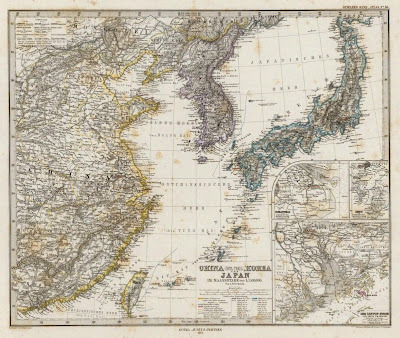 The reason I am posting the map is that I think it was mentioned in an 1876 letter written by Watanabe Kouki (渡辺洪基), who was Director of the Bureau of Documents in Japan's Ministry of Foreign Affairs at the time. 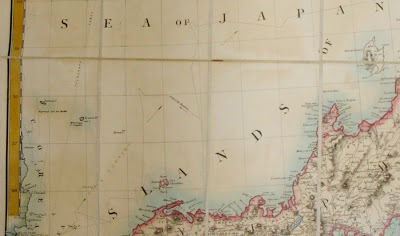 Mr. Watanabe was researching the location of Dagelet Island, which was the Western name for Korea's Ulleungdo Island, and he mentioned a map from "The Royal Atlas" as one example of several Western maps that showed Dagelet to be at the coordinates 37 degrees 25 minutes N. latitude and 130 degrees 56 minutes E. longitude. Mr. Watanabe wanted to confirm the location of Dagelet Island because he suspected the Japanese name "Matsushima" (松島) was being used together with "Dagelet" to refer to Korea's Ulleungdo Island. Traditionally, the name "Matsushima" or "Oki's Matsushima" was used to refer to Liancourt Rocks, which Mr. Watanabe believed to be Japanese territory. 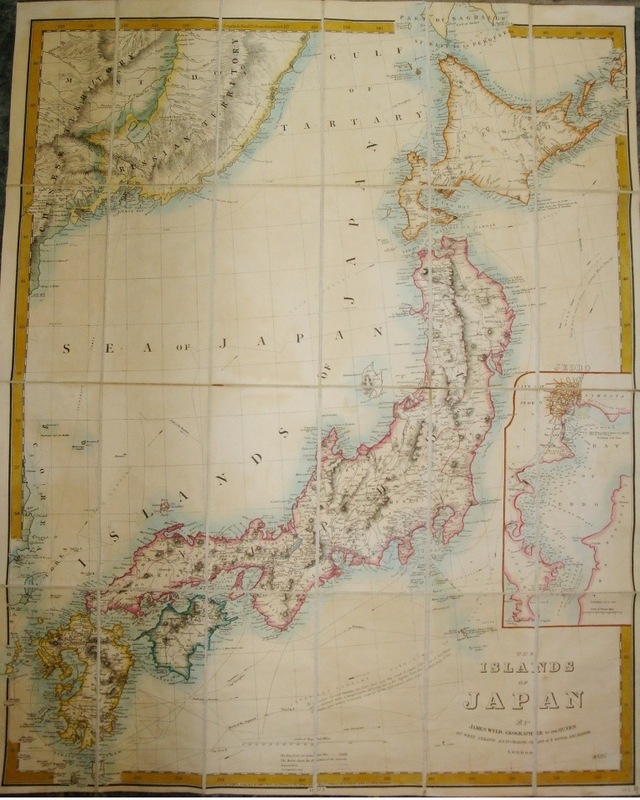 Though it is not 100 percent certain that Mr. Watanabe was referring to this map in his 1876 letter, it quite possible he was since this map does show Dagelet Island in the Sea of Japan. 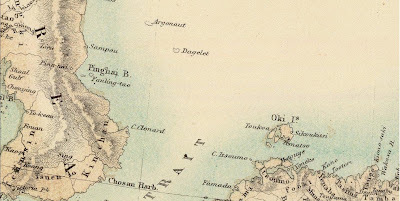 The map also shows an island labeled as "Argonaut," which was a non-existent island that came about due to a mismapping of Ulleungdo by the British Navy. 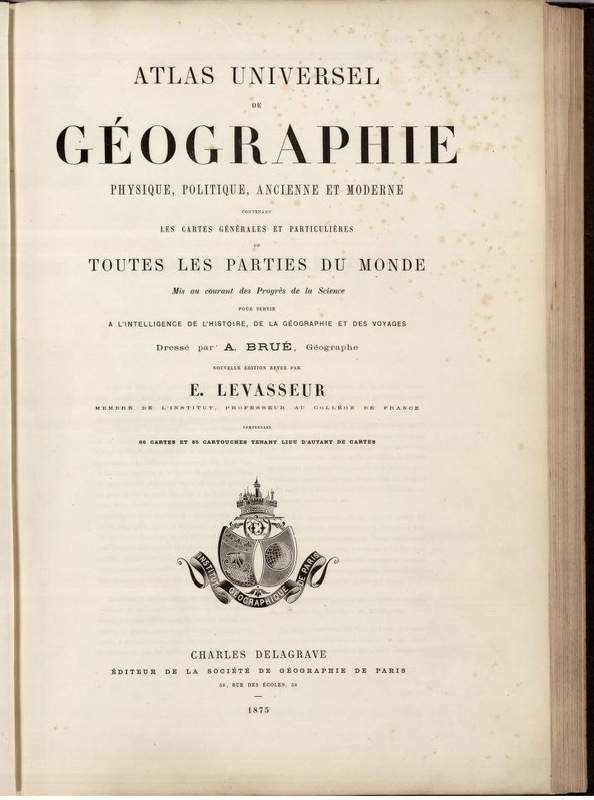 The following map, entitled "Carte Générale de L'Empire Chnois et du Japon," is from the 1875 edition of the "Atlas Universel De Geographie Physique," a French atlas with its authors listed as A. H. Brue and E. Levasseur. 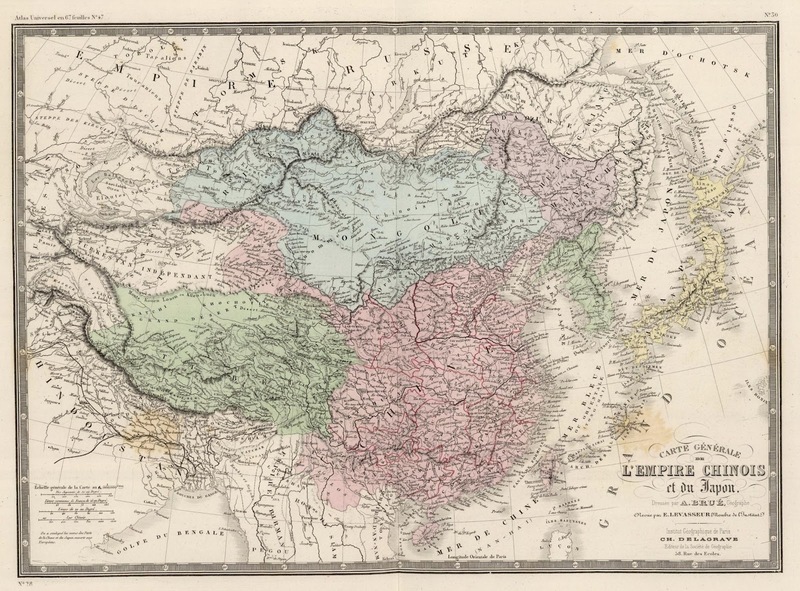 The map is entitled "Carte Generale de l'Empire Chinois et du Japon" and shows the counties of China, Korea, and Japan. You can read more about the map HERE. 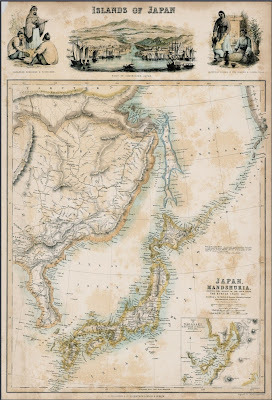 The reason I am posting the map is that it was likely mentioned in an 1876 letter written by Watanabe Kouki (渡辺洪基), who was Director of the Bureau of Documents in Japan's Ministry of Foreign Affairs at the time. 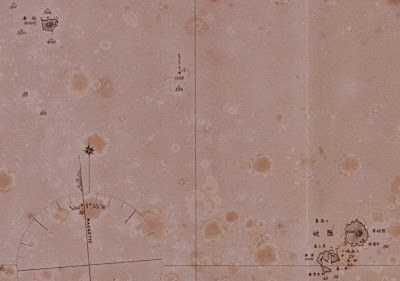 Mr. Watanabe was researching the location of Dagelet Island, which was the Western name for Korea's Ulleungdo Island, and he most likely referred to this map as an example of Western maps that showed Dagelet Island at the coordinates 37 degrees 25 minutes N. latitude and 130 degrees 56 minutes E. longitude. The map below shows an island labeled as "I. Dagelet," and an island labeled "I. Argonaut." Dagelet was referring to Korea's Ulleungdo, and the island labeled "Argonaut" did not exist because it was just a mismapping of Ulleungdo by the British Navy in 1789. Traditionally, the name "Matsushima," or "Oki's Matsushima," was used to refer to Liancourt Rocks, which Mr. Watanabe believed to be Japanese territory, but he suspected that the name "Matsushima" was also being used to refer to Ulleungdo. 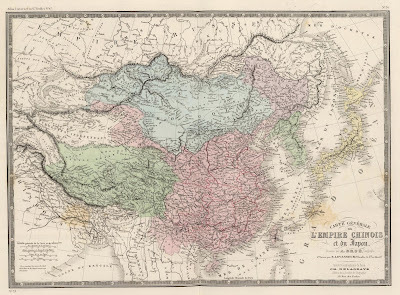 The following map, entitled "China, Korea, and Japan," is from the 1875 edition of the Stieler "Hand Atlas," which is recognized as "one of the most comphrehensive and best executed 19th century German atlases," according to the David Rumsey Map Collection Web site. The map itself has printed on it: "Gotha: Justus Perthes 1872," which seems to be the publisher and date of the original map. 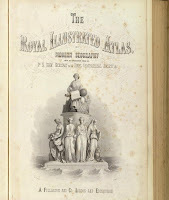 You can read more about the map on the David Rumsey Map Collection Web site HERE. 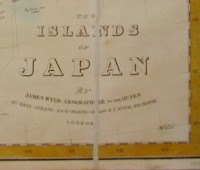 Mr. Watanabe used the map as one of several examples of Western maps that showed "Matsushima" as Dagelet Island (Ulleungdo), at the coordinates 37 degrees 25 minutes N. latitude and 130 degrees 56 minutes E. longitude. 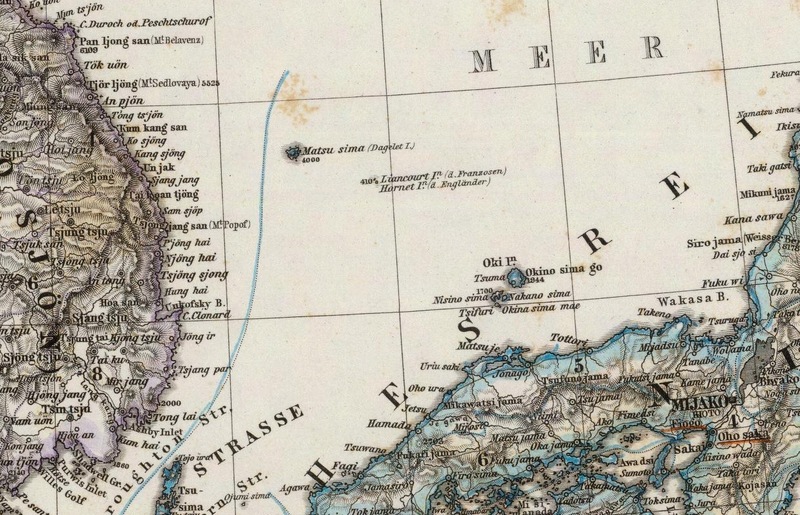 The map also showed Liancourt Rocks labeled both as "Liancourt In." and "Hornet In." In his letter, Mr Watanabe referred to Liancourt Rocks as "Oki's Matsushima." The purpose of the letter was to determine if Ulleungdo was also being referring to as "Matsushima." Mr. Watanabe considered "Oki's Matsushima" (Liancourt Rocks) to be Japanese territory, but he was uncertain of the other Matsushima, which he suspected was Ulleungdo. 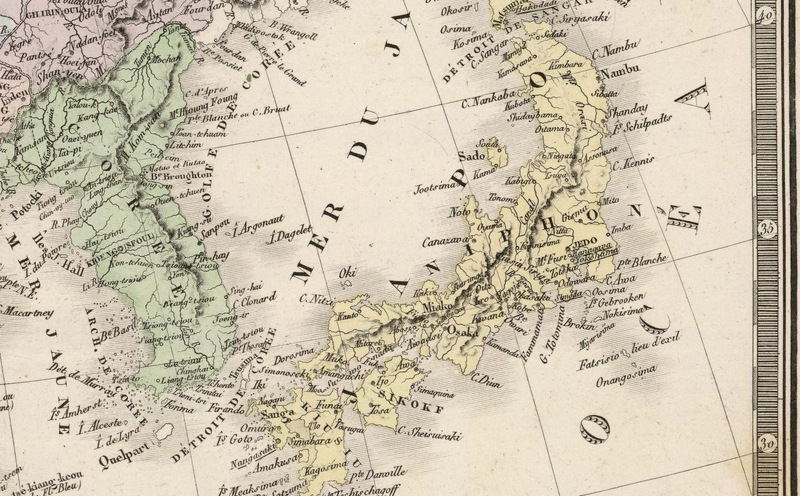 Though the map draws the boundry between Japan and Korea to the west of Ulleungdo (Dagelet I. ), Ullleungdo was already recognized by Japan as Korean territory. The mapmaker must have heard of the the Japanese island of Matsushima and assumed it was referring to Ulleungdo instead of Liancourt Rocks. 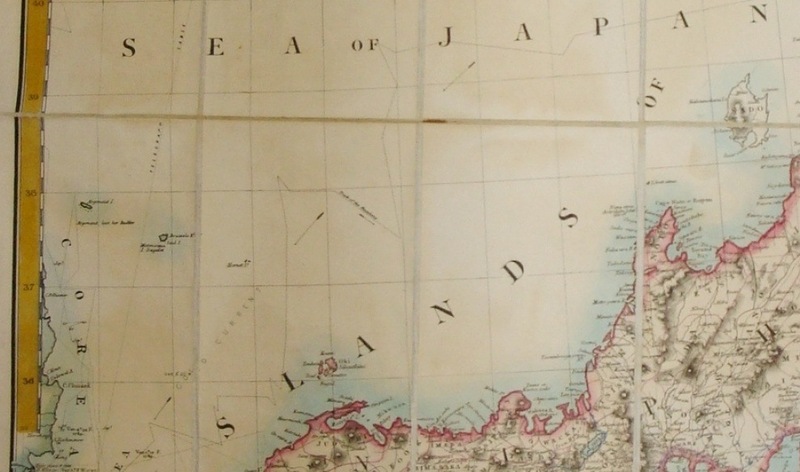 The map below is entitled "Full Map of the Japanese Coastline" (日本海岸全圖) and was made by the Japanese Navy Waterways Bureau (海軍水路局) in 1878. The map shows Ulleungdo labeled as "Matsushima" (松島) and Liancourt Rocks labeled as "Liancourt Rocks" (リアンフールト石). The sizes, shapes, and positions of the islands look quite accurate, and the non-existent island called "Argonaut," which many contemporary Japanese maps labeled as Takeshima (竹島), does not appear. The map seems to have been one of the more accurate Japanese maps of the region at the time. This map is a reduced, modified version of a map made by Ino Tadataka (伊能忠敬) in that it has omitted Hokkaido and added Korea and the East China Sea. 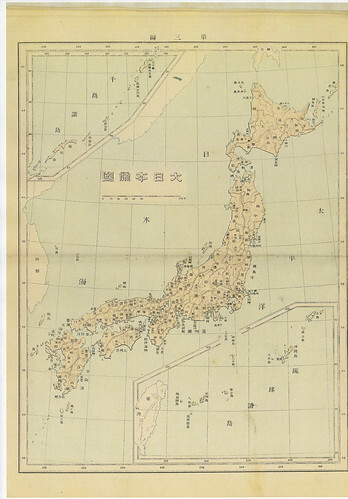 Traditionally, we have referenced Inō's map when drawing our country's coastal regions, but the surveying technology of his time was still imprecise, so there were frequent errors and omissions. Therefore, even though this map is based on Inō's original map, our navy has corrected the surveying errors of the coastal regions. For areas our navy has yet to survey, the results of Western surveyors were used as a stopgap to reduce suspicions our navy has with the original map. The navy intends to make furture modifications as soon as new surveys are available. This map is not perfect, but we hope it is of some help to those navigators who reference it. As you can see from the description of the map, Western maps were referenced for areas the Japanese navy had not yet surveyed, which almost certainly included Ulleungdo and Liancourt Rocks since the Japanese survey ship Amagi did not visit Ulleungdo until 1880 (See HERE). In fact, if you look at the comparison below with the 1876 British Navy map, you can see that the Japanese navy most likely got their surveys of Ulleungdo, Liancourt Rocks, and the Korean peninsula from the 1876 British map, which also does not show the non-existent island named Argonaut. 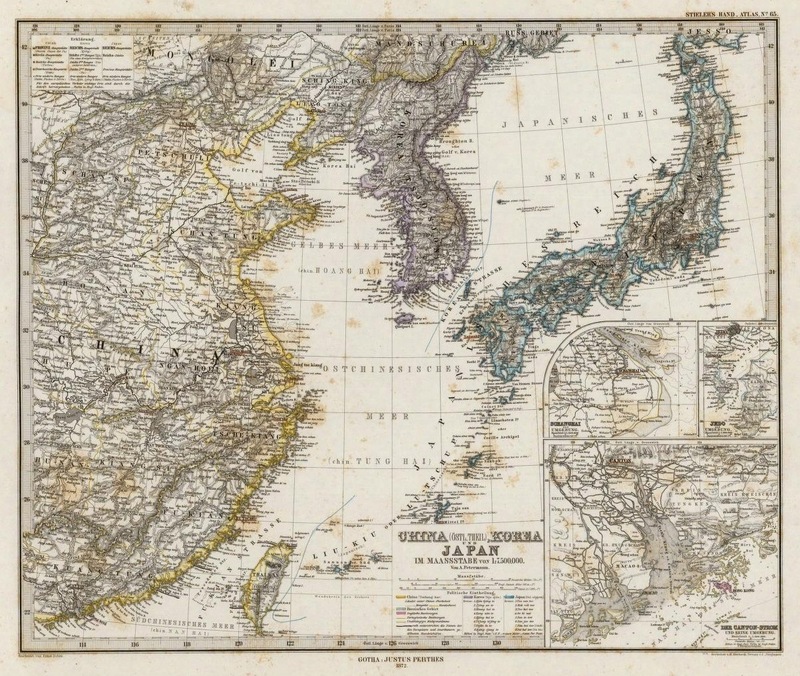 Japan's Council of State, the Dajokan (太政官), did not instruct the Japanese navy to survey Korean coastal waters until April 1878, so those results are almost certainly not reflected in this map. 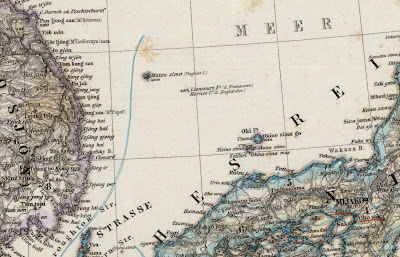 If you compare the above map section with the following section of an 1876 Bristish Navy map, you will notice that the sea depth readings and shapes of the islands are the same, which suggests that the Japanese showed Ulleungdo, Liancourt Rocks, and the Korean peninsula on their map by borrowing from the 1876 Bristish map. The British also labeled Ulleungdo as "Matsushima" and Liancourt Rocks as "Liancourt Rocks" and also omitted the non-existent island of Argonaut. The following is the description found in the right-hand corner of the Japanese map. 1876 - Watanabe Kouki's "Opinion on Matsushima - 1"
The following letter was written by Watanabe Kouki (渡辺洪基), who was the Director of the Bureau of Documents in Japan's Ministry of Foreign Affairs in 1876. The undated letter was written in response to two letters written in July 1876, one of which was a petition written by a man named Mutoh Heigaku (武藤平学) to develop an island he referred to as "Matsushima." We know that the Watanabe letter was written in response to the Mutoh petition because that is how it was described in an 1881 Japanese Ministry Report entitled, "A Study of Historical Evidence of Takeshima" (竹島考証). Here is what was written just before the Watanabe letter in the 1881 report. "In regard to the two above letters, Watanabe Kouki (渡辺洪基) wrote his opinion in two letters. Items No. 11 and No. 12 are those letters." The Mutoh petition was one of the "two above letters" in the report. It was labeled Item No. 8. This means that the Watanabe letter was written in 1876, sometime after Mutoh's July petition. You can seen Mutoh Heigaku's petiton HERE. The Watanabe letter explained that there was confusion in the Foreign Ministry in regard to the location of the Matsushima described in Mutoh's petition, but it also said that Liancourt Rocks (Matsushima / Hornet Rocks) were Japanese. Therefore, if the “Matsushima” being talked about here is Takeshima (Ulleungdo), then it belongs to them. If the Matsushima is not Takeshima, then it must belong to Japan. 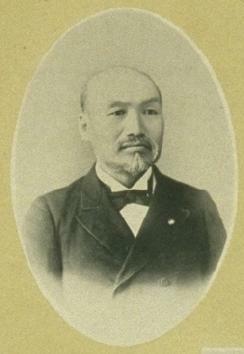 Mr. Watanabe urged that a survey ship be sent to the area to clear up the mystery, which is what the Japanese government eventually did in 1880. The survey determined that the Matsushima being referred to in the petition was, in fact, Ulleungdo. There are several brief descriptions of Takeshima (Ulleungdo) in past records, but there are no discussions of Matsushima. However, these days people are talking a great deal about Matsushima. There are various views. Some say that it is two islands, and some say that it is one island with two names, but I have not heard that it has been decided either way. The (mentioned) “Takeshima” is considered to be Chosun’s Ulleungdo, which the Shogunate ended up entrusting to them (Koreans) as a convenient quick fix, without considering future implications. Therefore, if the “Matsushima” being talked about here is Takeshima (Ulleungdo), then it belongs to them. If the Matsushima is not Takeshima, then it must belong to Japan. It is still inconclusive. The location of Matsushima is considered important because it is situated between Joseon and Japan. It is on sea routes between Nagasaki and Vladisvostok and between Shimonseiki and Wonsan, so this is a critical location, where English and Russian warships are frequently seen. So we should be very careful. Even if it is part of Joseon, we still have to protect it. As things stand now, we have no answers to give if other countries ask us about the island. This means the island is ownerless. Many records say that “Argonaut,” which is the Western name for Takeshima (Ulleungdo), does not exist, and that “Dagelet,” which refers to Matsushima, is actually Takeshima (Ulleungdo). So what we call "Matsushima” (Liancourt Rocks) is called “Hornet Rocks” by Westerners. Foreign maps show Hornet Rocks to be Japanese territory, but there is still no agreement among countries concerning the other two islands. We do not have the answers either, so the area should be surveyed to determine under whose jurisdiction it belongs. Therefore, we should first contact Shimane Prefecture and investigate their relationship up to now. At the same time, we need to dispatch a ship to do a survey of the area. If Chosun has already started, we need to determine their progress and consider our options. I respectfully urge that this matter be dealt with as soon as possible. 1893 - "The Empire of Japan" from "The New World Atlas" by The Fuzanbo Publishing Co. shows Matsushima as Ulleungdo, not Takeshima/Liancourt Rocks. 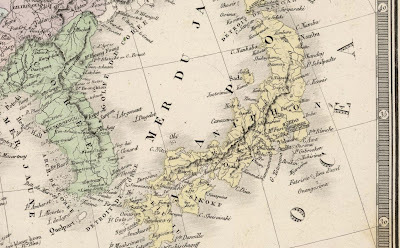 On 28th March, 2012, Korea’s Northeast Asian History Foundation exhibited 10 Japanese maps and claimed Japanese recognized Takeshima as Korean territory. However, as we can clearly see, there is no “Dokdo”, Japan's Takeshima/Liancourt Rocks, shown on it. The island labelled “Takeshima” is apparently a phantom island Argonaut, and the other, which is labelled “Matsushima”, is Ulleungdo, which located at 37°30′N 130°52′E. On the other hand, the island Liancourt Rocks located at 37°14′30″N 131°52′0″E. Because of the confusion of mapping error from western maps in the early 19th century, Japanese started to call Ulleungdo as Matsushima and believed this is a new unknown island which they can log the trees. After the on-site survey of Ulleungdo by the warship Amagi(天城) in 1880, Japanese government finally identified and conclueded that Matsushima is Korea’s Ulleungdo in 1881. At the end of 1881, the Ministry of Foreign Affairs and Interior confirmed Takeshima and the other island (Ulleungdo=Matsushima) is Korean, revealing “the other island” in 1877’s Dajokan order was not Takeshima/Liancourt Rocks, but Ulleungdo. 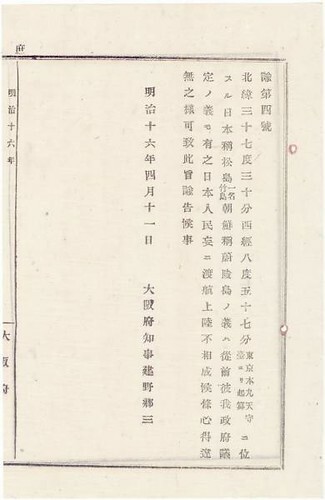 In 1883, the instruction which prohibits Japanese from travelling to Matsushima/ the other name Takeshima, which is Korea’s Ulleungdo, was announced officially to not only Shimane but also to the other prefectures like Tokyo and Osaka. The Maps published in the early Meiji era shows this recognition and no wonder this map “The Empire of Japan” shows Matsushima as Ulleungdo. The point is, Japanese Government lost track of Takeshima/Liancourt Rocks, the old name of Matsushima briefly. Japanese started to call the island “Ryanko” or “Ranko”. The island that Japan calls Matsushima or Takeshima and that Korea calls Ulleungdo, located at 37 degrees 30 minutes north latitude and 8 degrees 57 minutes west longitude (from the castle tower of the keep of Tokyo Imperial Palace), is the island that Japan and Korea had an document of agreement saying that Japanese would not sail to nor land on the island without reason. We hereby notifiy this fact so that there will be no confusion about it. I have no idea why Korean keeps making such an easy mistakes. 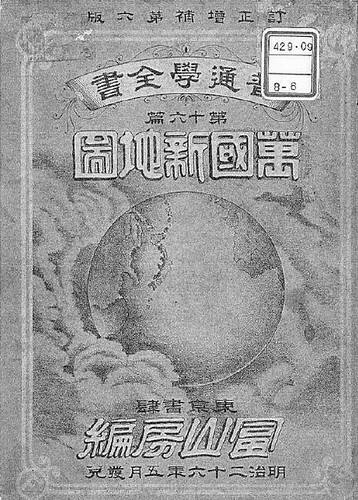 “The New World Atlas(『万国新地図』)” is the 16th series of “The Complete Book of General Studies(『普通学全書』)” published by Fuzanbo(冨山房). According to the production note of the atlas, the first edition was published in 1891. Ono Einosuke(小野英之介) is a son of Ono Gishin(小野義真), who was one of the promoters of Nippon Railway(日 本鉄道) and the one of the founder of Koiwai Farm(小岩井農場). He invested the money to Sakamoto Kajima(阪本嘉治馬), a representative of Fuzanbo Publishing. According to the book “50 years of Fuszanbo(『冨山房五十年』)”, Ono Einosuke was born in 1871 and graduated from Tokyo College(東京専門学校), the antecedent of Waseda University(早稲田大学), in 1896(the 28 year of Meiji). 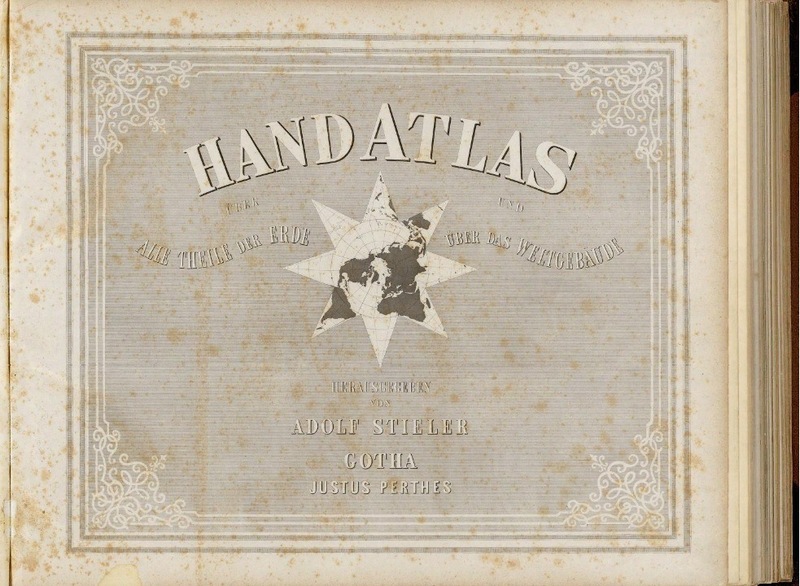 It doesn’t make sense that 20 years old student could make such a map in 1891, though.